Nothing but good news from the Kansas City Regional Association of Realtors May Report. Here are the highlights. There were 3,108 homes sold in the Kansas City area in May. By comparison, only 2,482 homes were sold in May 2012, so that’s an increase of 25 percent. 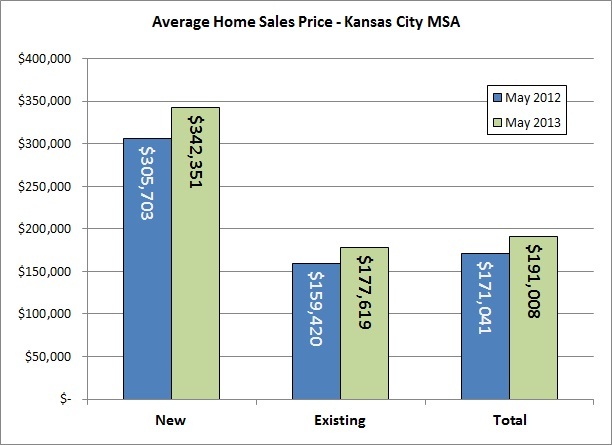 The average price for a Kansas City area home sold in May was $191,008. This marks a 12-percent increase over the May 2012 average sales price ($171,041). It is also the highest monthly average we’ve seen since June 2006, well before the recession. Strong increases were seen in both new and existing home sales. New homes sold for an average of $342,351 (up from $305,703 in May 2012) while existing homes sold for $177,619 (up from $159,240). Finally, the monthly supply of homes for sale is down to 5.6 months in May, compared to 7.2 months in May 2012. In other words, given the current level of market activity, it would take 5.6 months to sell off the existing inventory. This indicates a balanced housing market. A supply figure greater than six months is considered a buyer’s market, while a figure lower than five months represents a seller’s market. The next few months will be interesting. Will this balanced market inspire some homeowners who have long wanted to sell to finally enter the market? If so, it could temporarily boost the inventory and once again drop prices. Or, will the threat of mortgage rates creeping up cause prospective home-buyers to make the leap, driving up demand and average sales prices? We will have to wait and see, but it is great to be asking these more conventional housing market questions for a change, rather than asking when (or if) the housing market will ever recover.